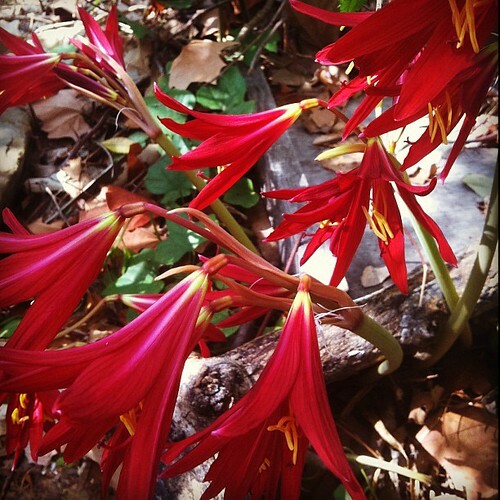 The Oxblood Lilies are telling me it’s fall now – the autumnal equinox has crossed over us with candles lit, and the scent of burning cinnamon bark. I mean to have a Mabon feast for the Witches’ Thanksgiving, but it will have to wait until I am more sorted out, and until it’s cool enough here for a proper bonfire. This year I sit on the porch with my mug in the mornings and talk to my animals. 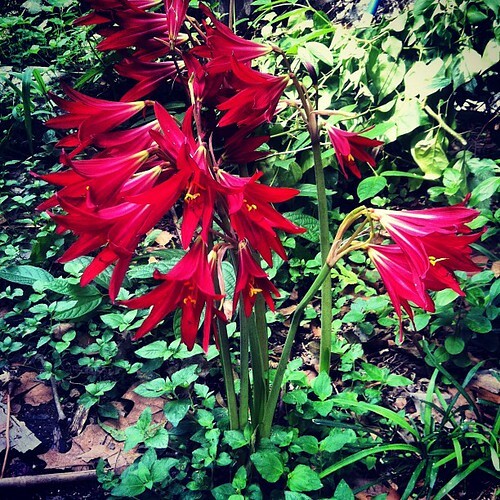 It is strange to mark this turning on my own, to have no stalwart sweetheart to remark upon the red blooms to. Very strange indeed. Everything is different now, everything is irrevocably changed, but still the lilies spring up like clockwork in the fall. 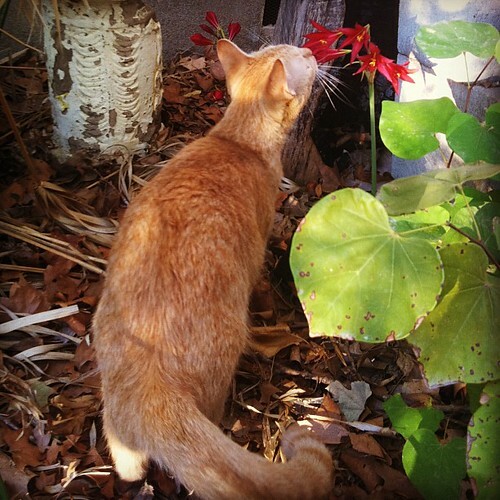 I keep having dreams and visions of blood and massacre, of creatures I love torn apart, red splashes on the earth, pieces of them strewn among the scarlet lilies. Terrible dreams. I am seeking to change where my mind goes – to realign my neural pathways and train my thoughts to follow better roads. It’s hard work. I’m glad this long, brutal summer is fading, but I fear another icy winter in this drafty old house. I’m stretching my arms up to the sky to beseech the weather wraiths for a long, golden autumn – full of fruit and all kinds of abundance. 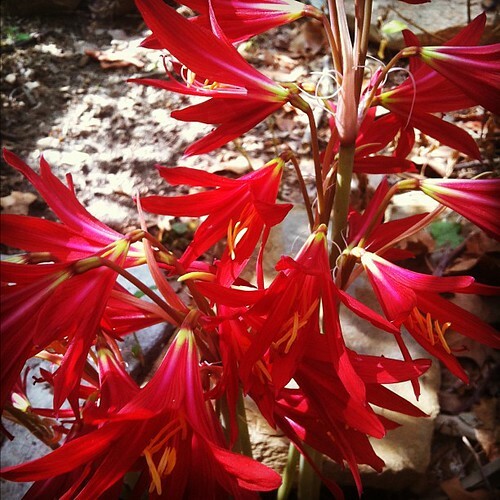 Crimson harbingers of cooler weather. The garden is bloody with them. Shrimp Scampi loves them too. 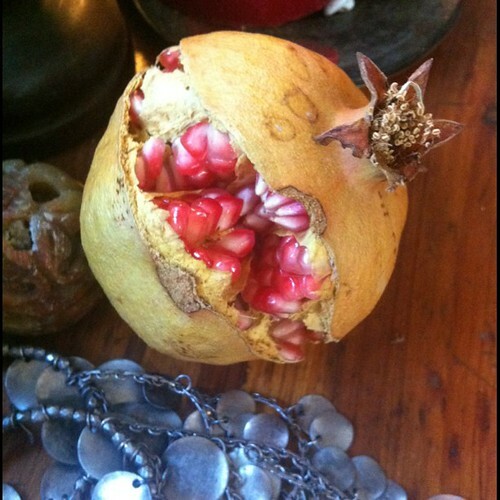 Split pomegranate, silver. It fell too soon from the tree. It’s soon harvest-time, though. 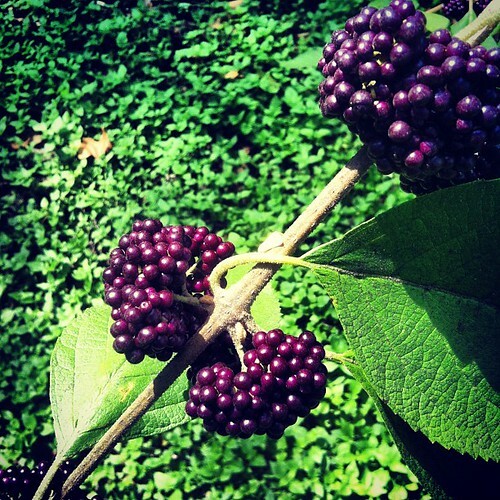 Beauty berry – goblin fruit. They look so delicious, but I think they are not for humans to feast on, alas. Sisters, I prescribe you a daily reading of this poem in Spanish and English to yourself as you stand naked before a mirror. I have also prescribed this same remedy to myself. Cuando vas por las calles nadie te reconoce. 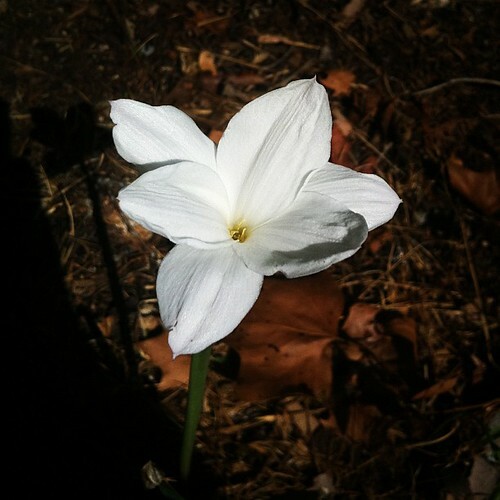 The rain lilies have been blooming constantly – a good omen for this autumn. They make me feel as if, contrary to how things feel right now, that I could find a way to believe in or hope for that last line to be true. I really do want to think so. came to grief, projecting it over & over on empty walls. web of cracks filtering across the plaster. initial split, the filaments thrown out from that impasse. lifeline, broken, keeps its direction. glass; to know in every distortion of the light what fracture is. of the inner city, the little book with gridded pages. i have been feeling elated, stimulated, lost and lonely…longing for more green and also for texas skies. thank you for this lovely reminder. i am very excited to see autumn colored dogwoods and maples and all of the lovely trees turning the colors that i have not seen in 12 years. Mmm, I am going through a similar transition in my relationship to poetry, I know exactly what you mean about the clutching maudlin thing. Lately I really love Marge Piercy and Mary Oliver in a way that would have been impossible when I was a snotty impatient teenager. Also, where the hell was that Dark Dark Dark album at those times when I was getting my heart torn up? So, so beautiful. 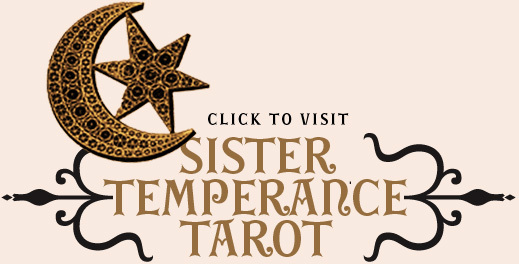 Also, do you do Skype tarot sessions? I’m doing so well, Angel, so much better than I expected I would at this point in my life. If you find yourself in the Bay Area in the next 5 months or so, please please let me know. Hang in there. All the curious madnesses have their own story -keep navigating towards that soul-truth and wonder and the pivot of innocence and experience. Walk that Black Mountain River of Autumn. Everything *is* going to be all right. Thank you so much for your kind words. Your writing as well, has also been a salve for me lately… It’s funny, I’m writing about climbing Black Mountain right now. It’s a long, twisty journey… Trying to believe that there will be sunlit glades up ahead.